Mercer Union | fORUM: Why Do We Do Things? fORUM: Why Do We Do Things? 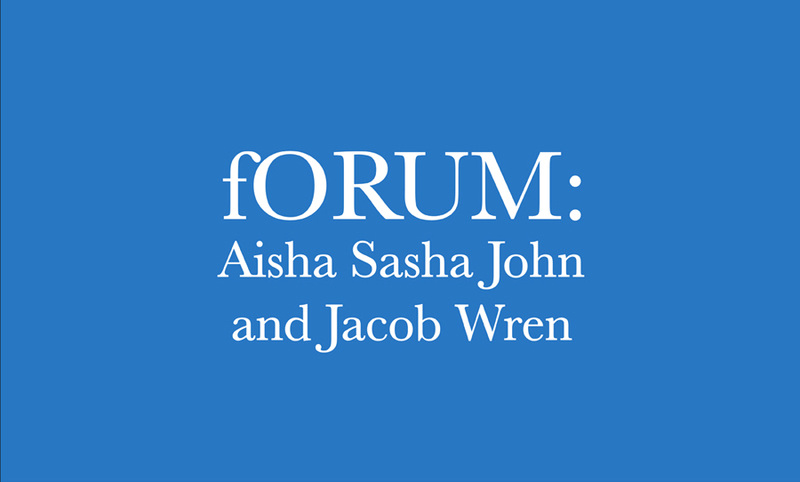 Mercer Union is delighted to announce that our eighth fORUM of the season will be a conversation between Aisha Sasha John and Jacob Wren. In both art and in life, why do we do the things we do? As Aisha wrote to Jacob: what might it mean to be wholesomely, hungrily ambitious – ambitious for life? And how might this connect to the multiple identities and self-questionings we often call art. Aisha Sasha John is a poet and dance artist. Her publications include THOU (2014) and The Shining Material (2011). VOLUNTEER, John’s solo, improvised dance show, premiered at the 36th Rhubarb Festival in February 2015. In 2014, she was one of four Canadian poets to participate in Princeton University’s “A Rhythm Party” and was a UNESCO-Aschberg Laureate Artist in 2013. John lives and works in Toronto. Jacob Wren makes literature, performances and exhibitions. His books include: Unrehearsed Beauty (1998), Families Are Formed Through Copulation (Pedlar Press 2007), Revenge Fantasies of the Politically Dispossessed (2010). Most recently, his book Polyamorous Love Song (2014) was a finalist for the 2013 Fence Modern Prize in Prose and one of The Globe and Mail’s 100 best books of 2014. Wren is co-artistic director of Montreal-based interdisciplinary group PME-ART.